A hardy Dutchman tackling the light snow and doing so in style. The photo is from David Hembrow's blog A View From the Cycle Path about a cycling life in Assens, Holland. As a fourth-generation basketmaker he produces splendid bicycle baskets, too. This famous bicycle advert by French artist and printer G. Massias was produced for Gladiator Bicycles in 1895, when the bicycle craze was peaking. There was a wealth of adverts featuring women and bicycles, a testament to the bicycle's liberating qualities in society. Only four original poster exist today. 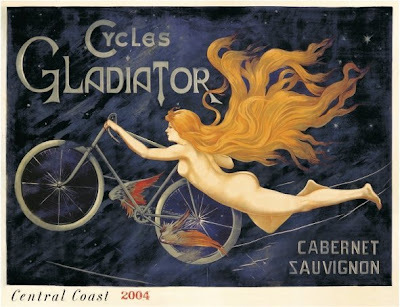 The poster and name is now used by - ironically - an American winemaker "Cycles Gladiator Wines" out of California. Thanks to Jan for the link. 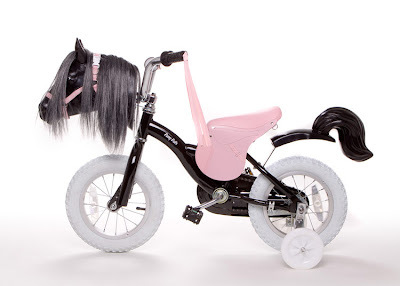 Now I'm not a girl and I don't have a pony fetish but this combi-bicycle from Pony Pals, at the very least, is stylish and kiddie chic. Any bicycle that is far-removed from the sweaty sports fetish is a good bicycle. While it may look to some like a kitsch Made in China plaything it's interesting - and strange - that the saddle is designed by master saddle maker Paul Selvey. Not only that, the pony's head is created by Lado Goudjabidze, who also created a bust of Gandhi for the UN Headquarters and JFK at the Kennedy Center. There are no prices on the website and I don't dare ask. Nothing wrong with cycling for sport. We need it in our sedentary western society. of course not. but unfortunately too many people have been told that cycling is ONLY a sport or recreation and not transport, like it is for 100 million Europeans each day.